Experience the unforgettable magic of Bonaire. The island's tranquil pace, natural beauty, and unforgettable diving make it a perfect vacation spot. Located in the southern Caribbean, Bonaire is just three hours south of Miami, Florida. Come get a taste the casual atmosphere and privately owned Bonaire apartments, villas, and condos, managed by us – Paradise Rentals. We (Rob and Zwanet) have been in the business since 2005 and we are managing several privately owned properties, including long term and short term Bonaire vacation rentals. 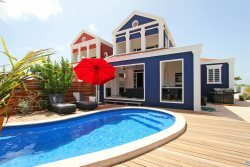 Throughout the years, we have built a beautiful portfolio of holiday rentals, offering accommodations in Bonaire oceanfront villa rentals, apartments and townhouses. Our team works hard to keep the accommodations in good shape on daily basis to insure your enjoyment of the best vacation rentals on the island.